Even though this process has lasted about six weeks, I feel as though it’s really been much longer than that. In a way it’s almost as though it’s been several years in the making. Since I was little, I always loved drawing and expressing myself creatively, and imagined myself being an architect (though I did major in Architecture in college for two years, I ended up switching to Education). When I started making my own wedding invitations ten years ago, I would never have imagined owning my own stationery business. I was in love with being an elementary school teacher and excited to spend the rest of my working years in that field. But after nine years and two kids, my heart was pulling me to stay home, which was something I had always wanted to do since my kids were born. I dreaded going to work every day and was struggling with relationships with my coworkers. The vision of what I wanted my life to be was changing and teaching was no longer part of it. After many late night talks with my husband, and shedding far too many tears, I left education to be with my babies. Part of me desperately needed to still be able to create, so I started designing fun birthday invitations for my kids and family friends. I opened an Etsy shop to sell my creations and began to realize that I could actually make some extra money from designing stationery. When a friend asked me to create her wedding invitations, I was a bit shocked, but thought I could try it (little did I know how much there was to learn in the stationery world!). I always had a fascination with weddings ever since I was a young girl and especially during my own wedding planning process. Being able to create someone’s wedding invitations made me elated, but I also felt so much pressure to make them right - because who would want to ruin someone’s special day? One wedding led to another, and another, and I finally made the decision to turn my hobby into a full-fledged business in 2015. I had fallen in love with the stationery side of weddings. The smell and feel of different papers. The way ink is pressed into the paper for letterpress. The slight impression that foil stamping makes on the page. Watching calligraphers work their magic. The ever-so-careful timing of wax seal stamping. And the hours of emails, designing, and assembling in order to create the perfect invitation for each couple. 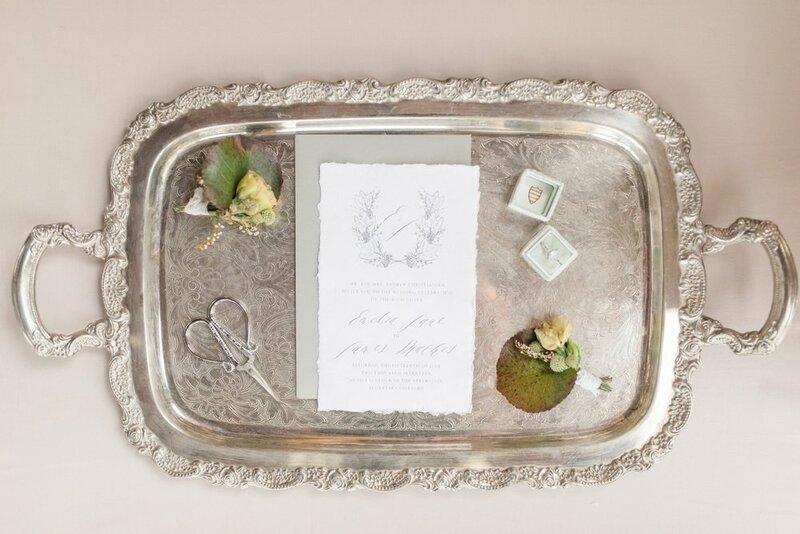 Wedding stationery is more than ink and paper. It’s my way of expressing to a couple how special their love and commitment are to each other. I may not get to be there on the wedding day itself, but I’m honored that they have chosen me to play a part on their big day. I’m now at the point in my business where I’ve made it through survival mode and am starting to make myself known in the local wedding industry. But I felt as though my current brand and website didn’t reflect who I was and what I wanted my business to be. After many, many hours of research, I came across Magnolia Creative Studio and reached out to Sofia, the incredibly talented woman behind it. I knew that she would be able to help me solidify my vision and would be able to create the brand and website I so desperately needed. This new brand is a true reflection of my style and personality. I hope that my future wedding clients can feel the pride that I take in creating their wedding stationery, and I am excited to start working with them!